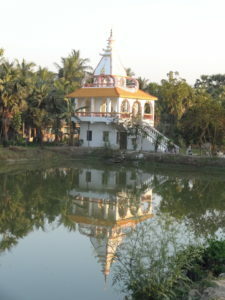 A temple S of Kolkata near the river in the village of Teillary. Our bags are almost packed, but too many details remain. On one level it seems crazy to be returning to India, but Mother India tugs on my heart strings from 7000 miles away. To many Americans yoga is primarily focused on relaxing and perfecting the body. But yoga is also about calming, expanding the mind and opening the heart; and what better way, except for meditation, than launching oneself into a totally new environment. In India the curtain that separates the physical from the ethereal is much more transparent if you are receptive to it. I’m looking forward to Bodh Gaya where the Buddha received enlightenment and the caves at Ajanta and Ellora. I look forward to being responsible for absolutely nothing except reading, meditating, meeting new faces, and of course, getting to the train on time. Believe it or not, I look forward to seeing my favorite driver in Kolkata. I have to ask him to repeat whatever he says at least three times before I can understand his English. I’ve known him as a young man and now as a father and husband. He, like many other folks we meet, doesn’t need meditation or yoga. He is one hundred percent present with David and I and so empathetic. Being of service is not so much about a bigger tip but a part of every fiber of his being. I fondly remember our driver and guide through the Himalayas near Rishikesh (three years ago). I took one look at where he thought I was going to hike and said, “I’ll go part way and then come back and sit in the car.” David was already on the trail walking at his own pace (not wanting to listen to my complaints). Our guide didn’t accept my wimpy attitude. He took my hand, and we climbed and climbed. What really kept me going besides the incredible landscape was our conversation and a sense of a deep soul connection. This man lived half way around the world in a very different culture. Yet our thoughts, concerns, hopes and dreams were the same. Am I excited about traveling yet? Nope, I’m usually anxious until that moment when the seat belt clicks and the wheels of the plane lift off. Then the dream of my life fades into the blue sky and a new one begins. Besides, in India every day is an adventure, filled with intricately flavored foods, and, more importantly, a great cup of masala chai. If you’d like to join me on this journey, just click “follow” at the bottom of the page. I have some beautiful photos and stories to share. Not about the dirt, noise, pollution and poverty that is, for many Americans, the preconceived ideas we hold of India. I’ll write to you about the deep spiritual heritage that Mother India brings to our world. 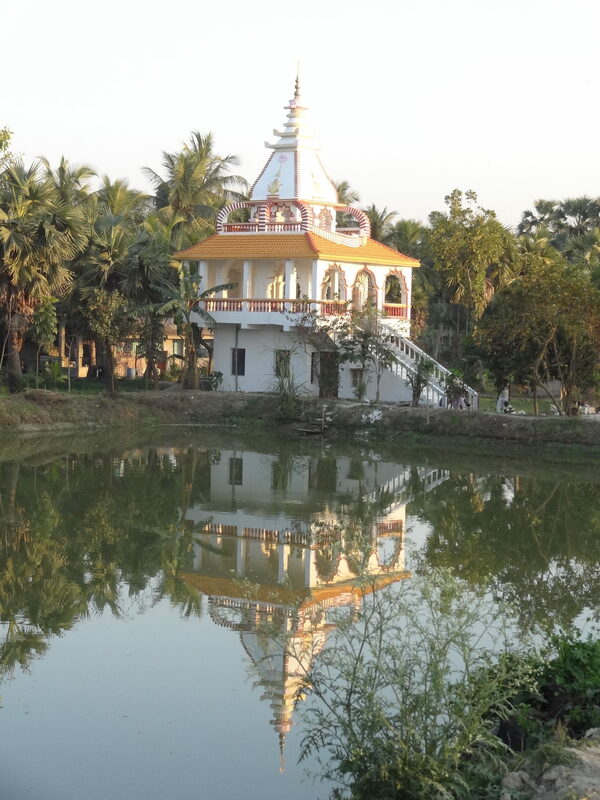 This entry was posted in India, Kolkata, Travel in India. Bookmark the permalink. I wanted to let you know, I went to your house to get some fillers and when I got to the temple, realized wrong weekend again! it was the 5th, we are the 4th. I have to stop counting the Saturdays instead of the Sundays…So now we have some pretty flowers at home. I saw you had a lot of apples on your tree. Is there someone who will keep an eye on them, or would you like me to pick them when it’s time and put them in your fridge? When are you coming back again? Let me know also if there is anything we can do for you, while you are gone. I am hoping things will slow down some now. By now you and Dave must be unlagged and on with your journey . Intended to go before the rains due but will wait til after they pass phaps Monday and Check on things. We are well. See the section below now the Reply box for logging on. Sending Love to you and David.